A family owned business, SieMatic has been driven to develop exemplary kitchens since 1929. Striving to set the standard in a variety of individual planning options, elegant design, precision workmanship and quality materials, SieMatic is a global leader established in 60 countries around the world. Believing in lifestyle instead of kitchen ranges, each individual SieMatic kitchen design becomes a unique reflection of the personal style and taste of each person. 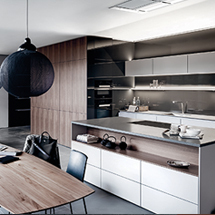 Available in Pure, Urban and Classic, SieMatic offers a wide range of cabinet finishes to suit all styles and budgets. Each SieMatic drawer and cabinet offers a range of customisable inserts, including cutlery inserts, cling film dispensers and Nespresso pod holders. See all these features and more at the Southern Innovations Fyshwick showroom.